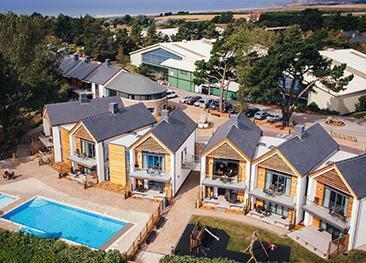 The Merton Hotel is a 3 star resort-style hotel on the outskirts of St. Helier. The hotel provides an extensive selection of accommodation options, restaurants, bars and the Merton Aquadome, including the UK's first surfing flowrider. Voted the fifth-best family hotel in the UK at the TripAdvisor 2019 Travellers’ Choice Awards, the Merton Hotel is a substantial 3 star resort-style hotel on the outskirts of St. Helier. 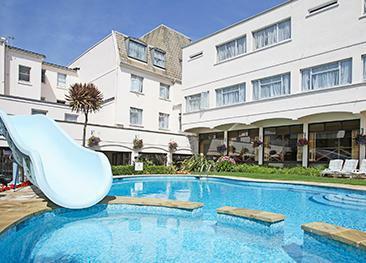 The hotel provides an extensive selection of accommodation options, restaurants, bars and the Merton Aquadome, one of Jersey's premier leisure facilities including the UK's first Flowrider Surf Machine. A Crêche, free Kids Club and a free Teenage Club are available for the young ones and free live music and evening entertainment are regularly featured. Flexible accommodation with a choice of twin, double, triple and family en-suite rooms. All rooms are equipped with direct-dial telephone, flat screen satellite television, free 24 hour kids movies, hairdryer, tea & coffee tray, an iron & ironing board. All floors are accessed by lifts and every guest room has baby-listening facilities as well as free WiFi. Buffets are on offer for breakfast and dinner. Nightclub with quality evening entertainment at various times throughout the year. 50's style American Diner serving hot-dogs, burgers, ice-cream shakes. Snacks and drinks by the pool. The Merton’s own pub and sports bar. The Merton Aquadome features indoor & outdoor swimming pools, spa baths, flumes and a lazy river. The climate under the dome is maintained at a balmy 27°c, ensuring a fun day for the family whatever the weather! Perfect for all-season “Flowboarding” which is best described as surfing on a wake or boogie board. The Merton is located on the outskirts of St. Helier town centre, with Jersey’s main shopping area within walking distance, the beach a few minutes’ drive away and the rest of the island’s attractions easily reached by car or bus. The Merton has good disabled access. All floors can be accessed by lifts. This is, in our opinion, the best family hotel and our family,s favourite hotel. Lovely room & facilities,particulary the leisure areas.Easy walk into St Helier & beautiful park on the doorstep. Friendly staff, helpful when we hit a difficulty with the carrier. evening entertainment (including piano in lounge) we will return. Positives -Hotel breakfast was great. Cleanliness of rooms excellent. Entertainment provided. Pool area great. Some staff polite and helpful. Negatives - We asked repeatedly for a plug for the sink in the 2 weeks we were there - but it never arrived.